MSW-ARS Blog » Millennials and Private Label – a Blossoming Problem for National Brands? Home > Ad Pre-Testing, Brand Experience, The Brand Strength Monitor	> Millennials and Private Label – a Blossoming Problem for National Brands? It has been well reported and documented that private label brands are surging in the US. Whether it is due to their optimal mix of great value and experience or other reasons, they have forced name brands to re-think strategies. It is also well-known that Millennials are contributing to this trend as they are prioritizing experience over attainment. In this short blog entry, we aim to show just how important this generational dynamic is to the future of private label brand purchasing. In addition, we will also highlight solutions MSW-ARS has for helping name brands both measure and address concerns in this area. 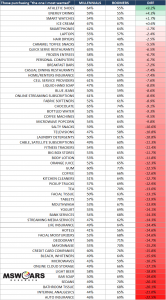 First, it is important to note just how much of a generational difference there is with regard to purchasing name brands “wanted most” in the table below comprised of thousands of responses across 60+ categories. The difference between Millennials and Baby Boomers is far greater than any other standard demographic. 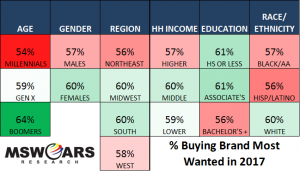 This suggests that age is one of, if not the most important socioeconomic indicator in determining one’s propensity to buying brands they most desire. It is not that Millennials do not desire name brands, they are just choosing not to purchase them at the same rate as previous generations. 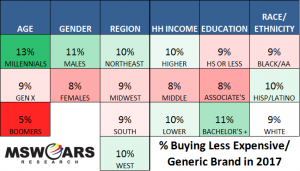 Not surprisingly given “wanted most” trends, Millennials are also the most likely to purchase cheaper/generic brands. In the table below, Millennials are well over twice as likely to buy generics/less expensive brands versus Baby Boomers. What does this mean for some of the individual categories we track? Here are a couple of tables showing the differences between Millennial and Baby Boomer purchasing in 2017. Is this just a life stage phenomenon? Will Millennials’ purchase patterns more resemble Gen X and eventually Baby Boomers once they become older? While it is possible Millennials will more resemble previous generations as they age, we are not confident that they will. When compared to previous generations, Millennials have lower income, which in turn would suggest why they are turning more toward generics/lower priced brands as opposed to brands they truly want. However, in the tables above, the three income tiers do not differ much with “most want” and “less expensive/generic” purchasing, especially when compared to the generational tiers. So, unless another Millennial age-dependent characteristic is currently driving their added tendency toward purchasing generics/less expensive brands, and will eventually go away (perhaps something like high student loan debt, which was not tracked), then we believe the generational data is more of a change in attitudes toward generics/name brands than any special constraint unique to any younger generation. 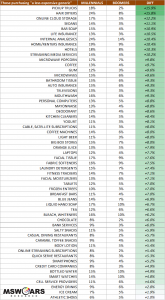 In addition, the previous tables show very different trends in purchasing behavior simply based on different categories. Millennials have similar buying trends to Baby Boomers with categories such as Athletic Shoes, Energy Drinks, and some Electronics, while they are MUCH more likely not to buy what they most want when purchasing a Sedan, Analgesics, or Bathroom Tissue. To us, this further suggests Millennials are not just defaulting to generics/less expensive brands everywhere, they are simply realigning what is worth paying more for. If current trends hold, then what does this mean for the generations after Millennials once they become a large portion of the consumer base? Those born in the year 2000 and later are entering the market for many different goods and services now that they are turning 18 and becoming adults. Scenario 1 – Continuing Trend: If current trends hold, then we could very reasonably expect the next generation after Millennials (Generation Z) to be even more likely to purchase generics/less expensive brands and less likely to purchase the brands they truly want. Scenario 2 – Millennials Become Like Gen X: If Millennials actually do go on to more resemble earlier generations as they age, then we can reasonably see a situation where the generations simply “replace” one another. Generation Z would have purchasing behavior close to that of today’s Millennials, while Millennials become more like today’s Gen X, and Gen X becomes more like today’s Baby Boomers. Scenario 3 – Current Trends Are Just The Tip Of The Iceberg: A lot of trends begin with younger people, then eventually spread to the older population (see social media). If this happens with generic/less expensive brand purchasing, then it’s possible that ALL of the current generations could eventually see an increase – even Baby Boomers. This would likely be one of the worst developments for name brands that may be at a price premium. We also should not fail to mention another scenario, which is…no one really knows as of right now. Unlike the previous three scenarios, this is the only one we can currently believe with high confidence. That may sound discomforting, but there are action steps you can take in order to be fully prepared for what comes next on this front as well as future decisions for your brand. We at MSW-ARS offer custom, cost-efficient solutions to both diagnose and address potential brand and category decisions that may arise via the rise of generics/less expensive brands or others elsewhere. To diagnose category and brand opportunities, we offer custom tracking that can be as streamlined or in-depth as you prefer. In fact, the data used in this blog post is from our syndicated Brand Strength Monitor platform (TBSM), which includes our choice metric that is the ONLY validated measure of brand value – and at a low cost. For example, with that particular data, you will be able to diagnose where your category stands in this generational battle, and be able to see the impact for your specific brand relative to other brands (not shown in this blog, but is very easy to do). To help address these opportunities, we offer our strongly validated copy testing products that can help determine which route is the best for your brand to take in order to make the best decision for overcoming the rise of generics/less expensive brands, as well as others. With the rise in popularity of generics/less expensive brands, we have made improvements to our copy testing methodology to help directly address this area. Our approach aims to identify the consumer journey, and how brands can make themselves relevant to consumers’ growing desire for experience. Please do not hesitate to reach out if you would like additional information regarding this blog post or what our custom products can do for you.